And, I must be shallow. 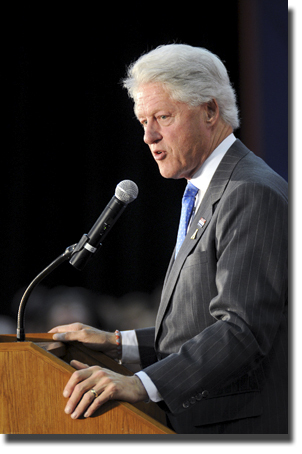 One of the first things I noticed about President Clinton, besides that he looks exactly like he does on t.v., was the jewelry he was wearing. He sported a handsome Appalachian 'Block A,' on his lapel. That's a good look for him and he should continue wearing it. The other was the red and blue bracelet he wore on his right hand. I looked on the internet and found there are two different stories behind the wearing of the bracelet. Go figure.